Those pesky Americans get around. 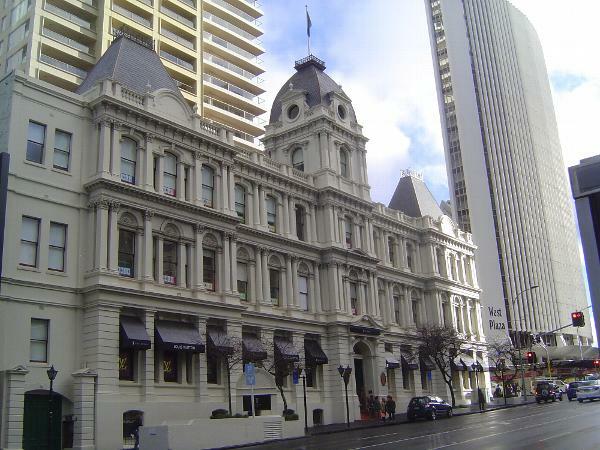 Here's another example: it's the Old Custom House, from 1889. The Customs officials occupied the ground floor, where in the Long Room they processed shipping documents. Upstairs, space was rented privately. By 1970 the building was vacant and probably would have been demolished had not this "most imposing building in the city" caught the eye of John Hulbert, an American then developing the Hyatt Hotel (now the Warwick) in Fiji. It was a big job, requiring a new steel frame, but today the building is the DFS Galleria. DFS, in case you don't keep up with these things, is a Hong Kong company controlled by LVMH but established by Robert Miller and Charles Feeney as Duty Free Shops. Its initials hide its plebeian ancestry. See Robert Goodman in Art New Zealand, 1982.